Sayer Burnett is a small firm focusing on commercial and residential property and private client work, based in central Edinburgh but with a client base extending throughout Scotland and beyond, offering fluent German and a working knowledge of French. Sayer Burnett strive to offer a personal, friendly, efficient and competitively priced service and are available to speak to you 7 days a week. We like to get to know our clients well to allow us to respond positively to their needs. 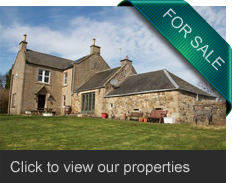 We have property being bought and sold by our clients throughout Scotland and are available to deal with any enquiries 7 days a week and offer excellent sales service and affordable agency fees without hidden extras. Use the links on this page to get more detailed information on what we can do for you in private and commercial property, commercial leases, wills and power of attorney future planning, executries and company work. We have excellent contacts elsewhere covering specialisms we do not deal with. We are always happy to discuss any problems in the first instance and point you in the right direction. Feel free to contact us at our office on Circus Lane or by phone or email. We look forward to being of service to you soon.